Kidliterati: K10 Special Edition: Star Wars Reads Day 2013! K10 Special Edition: Star Wars Reads Day 2013! Today on the Kidliterati Ten we are thrilled to participate in Star Wars Reads Day! Fans of reading and a certain galaxy far, far away have reason to rejoice! Star Wars Reads Day, a day-long celebration of literacy and Jedi, Sith, Wookiees, and all things Star Wars, is to be held this October 5, 2013 and is a nationwide multi-publisher initiative. Check out the official Star Wars Reads Day site for information on author events and locations, participating publishers, downloads, the Star Wars Reads Facebook page and more! I am Sammy. I am 8 years old, and my favorite ice cream flavor is strawberry with whipped cream. I chose JEDI ACADEMY because it looked really cool because it was a graphic novel and it was about Star Wars which I love. Roan usually stinks at using the Force, but for his last assignment he had to lift one boulder with the force, but he actually lifted many boulders. He got an A+. I thought that part was cool because he accomplished what he wanted and was able to finally use the Force. Roan’s problem was that he stunk at being a Jedi. I’m not a Jedi. I wish I could be a Jedi. If there were real Jedi I think I would be good at wielding a light sabre and using the Force because I’m smart and kind. Also, I took fencing which is not exactly like using a light sabre, but kind of close. But if I stunk at being a Jedi I would do what Roan did and try hard. If you like Star Wars you will probably love this book because it is about a Jedi and it is very funny. The drawings are pretty funny too. I like it because it has a great drawing of the main character and Yoda. And Yoda is one my favorite Jedi so that automatically makes the cover cool. I would definitely want to read another book about Roan because this book was interesting and the author could write more about his training. I hope to see Roan go on many more adventures. This is the first Star Wars book I’ve read, but a book that reminds me of this one is AMULET by Kazu Kibuishi because it is also a graphic novel and the amulets have powers that are similar to the Force. Can I only ask one question? Because I have a lot of questions! Is the author going to have other books in the JEDI ACADEMY series (I hope so)? Which was your favorite Star Wars movie and why? If you write a future book, will Roan ever meet Obi Wan (he's my favorite Jedi)? Yes, there will be more Jedi Academy books! I'm working on book two now, which should be out next year. And there'll be at least one more book in the series after that. My favorite Star Wars movie is The Empire Strikes Back, because of Yoda, the bounty hunters, Han and Leia, and pretty much everything that happens on the planet Hoth. Roan's story in Jedi Academy happens before Obi Wan is around - about two hundred years before Episode I. I do plan on him meeting some more Jedi at some point, though. Thank you Sammy and author Jeffrey Brown for sharing Star Wars: Jedi Academy with the Kidliterati. My first name is Nathan. I'll be 6 next month! My favorite ice cream flavor is strawberry. The Yoda Chronicles. Because I like Star Wars and legos. When the clones turned bad. If I was Yoda, I would go the Darth Sidious, grab his cloak and make him trip, steal his light saber, and I would defeat him with the two light sabers. It has all kinds of things in it. Legos and light sabers! And also blasters and giant creatures. Looks awesome. I love the LEGO character included! Sure, I would love to! Because I like Star Wars and I love legos. The other LEGO books, like the one about Batman that I have and comes with a Batman mini-figure and tells you all about the sets. Did you get to play with the LEGO sets you show in the book? Lucky for us, the author, Daniel Lipkowitz responded to Nathan's question! "I didn't get to build and play with the specific models that were photographed for the book, but they are all ones that I've handled over the years, so I knew their features and functions. I have a big LEGO set collection myself, and of course that includes lots of Star Wars sets!" Thank you Nathan, author Daniel Lipkowitz and DK Books for sharing LEGO Star Wars: The Yoda Chronicles with the Kidliterati. 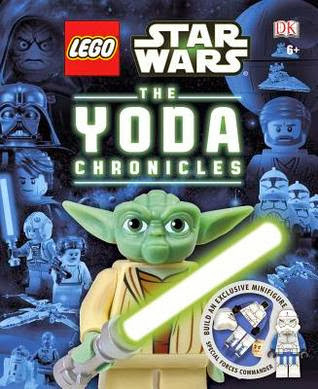 And thanks to our friends at DK Books, Kidliterati has a special giveaway of LEGO Star Wars: The Yoda Chronicles from DK Books! We know you will love this book as much as Nathan. Click on the Rafflecopter below to enter. Who knew Yoda had such awesome moves? In 6th grade, my friend John Siegel and I were Star Wars FANATICS. We did everything Star Wars. Mr. Zoller gave us creative writing assignments every Friday, due on Monday. He got sick and tired of us suggesting Science Fiction topics, though, just so we could inject Star Wars into our stories. I was just coming out of the movie theater when Han Solo screeched up in a Trans Am and shouted "Come on Kid! Chewie's warming up the Millenium Falcon!" My favorite Star Wars memory. My favorite is my son when he was about 7 dressing up as Darth Vader at the Zoo's Halloween party. He is still a Star Wars fan. Favorite Star Wars memory as a kid is watching Luke Skywalker. :) As a mom, watching Star Wars with my kids and dressing them up in Star Wars costumes for Halloween!